Today, HRC is celebrating International Transgender Day of Visibility. 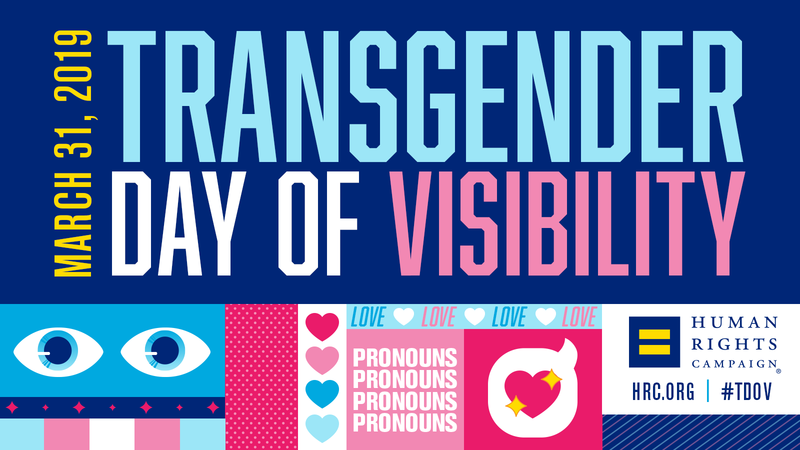 Held annually on March 31, International Transgender Day of Visibility is a time to celebrate transgender and non-binary people around the globe and acknowledge the courage it takes to live openly and authentically. Advocates also use the day to raise awareness around discrimination and violence that trans people still face. Earlier this month, HRC marked introduction of the Equality Act, a comprehensive LGBTQ non-discrimination bill, with a video chronicling the story of Carter Brown. Brown, a transgender man, who faced months of discrimination and harassment before ultimately being fired from his job after he was outed as transgender to his co-workers. The Equality Act would significantly benefit the transgender and non-binary community, which reports some of the highest rates of discrimination and violence within the LGBTQ community. According to the HRC Foundation’s 2018 Gender Expansive Youth Report, less than a quarter of transgender and gender expansive youth feel like they can definitely be themselves at home or at school. In November, HRC released a report detailing the ongoing epidemic of violence targeting the transgender community, particularly Black transgender women. Discrimination in employment, housing and public spaces and services can significantly contribute to pushing transgender people into circumstances where the risk of violence may be more likely, and the report calls on Congress to pass comprehensive non-discrimination protections as a step toward combating the violence. The report also highlights how anti-transgender policies and political rhetoric can embolden hate-based and -influenced violence. Ahead of International Transgender Day of Visibility, a bipartisan majority of the U.S. House on Thursday voted in favor of a resolution opposing the Trump-Pence discriminatory ban on transgender troops. Just weeks before, five brave transgender service members - Navy Lt. Cmdr. Blake Dremann, Army Capt. Jennifer Peace, Army SSgt. Patricia King and Navy Petty Officer Third Class Akira Wyatt - testified before the U.S. House Armed Services Subcommittee on Military Personnel for the first time in history. HRC recently released a powerful video chronicling their stories and the dangerous and discriminatory impact of the Trump-Pence transgender troop ban. Reflecting growing public support for transgender equality, an overwhelming majority of Americans - 70 percent - support allowing transgender people to serve openly in the military, according to polling from Quinnipiac University. To learn more about HRC’s work on transgender equality, visit HRC.org/transgender.